New York City Subway Resources: A standard by which all others should be judged, this wealth of information about the NYC subway system and commuter rail in the NY Metropolitan area is a must-visit site. From rosters to photo pages to historical information, New York City Subway Resources has it all. RailServe. The "Yahoo" of Railroad Sites. Features a searchable index, chat rooms, and more. New York City Metro Area Rail Resources. This site contains a collection of pointers and information about rail related subject matter in and about the New York City metropolatian area. Lots of good info. Penny Bridge. A fascinating collection of information about carfloats and the various rail-marine operations in and around the New York City harbor area. Cyberspace World Railroad. Images, Amtrak schedules, news articles, the runaway train, and lots more. This site is a wonderful assortment of railroad information. Something of interest for every railfan. Webville and Hypertext Railroad Company. A site for the archiving of historical and informational documents and binaries concerning Railroads, Railfanning and Model Railroading. Hoboken Terminal. The greatest Railroad Terminal on the Hudson River! Lots of NJ Transit data here. TrainWeb. Information and photographs relating to passenger, freight and model trains in the U.S. and Worldwide plus items of interest to the professional rail industry. Be sure to check out the Rail Travelogues section. Ahead of the Torch. This site, dedicated to railroad preservation, is temporarily unavailable while it searches for a new home. AOTT should be back soon. Railroading in the North East. This teriffic site contains all kinds of beautiful photos of both sides of all American and Canadian diesel engines for modelers and trains spotters as well as a pictorial history of railroading for those who missed the golden era of rail. The Susie-Q is a favorite railroad of many railfans. With its scenic rights-of-way and beautiful yellowjacket locomotives, the Susquehanna is a wonderful operation. Official NYS&W Railway Corporation Homepage. Currently under construction. New York Susquehanna and Western Technical and Historical Society. This is the offical website for the Susie-Q's historical society. News, pictorials, and a chat room are among the featured items here. Unofficial NYS&W Web Page. A Susquehanna fan page. Includes some great pictures and locomotive status reports. Check this site often as it is updated frequently. Susquehanna.Railfan.Net is a new site with lots of info and photos from the Susquehanna. Mike Brandt posts the Susquehanna Photo of the Week each Tuesday. NEW! Utica Railfan Guide is loaded with Susquehanna info and pictures. NEW! A Fall Foliage Trip to Baird's Farm nicely details the 1997 Southern Division Fall Foliage Excursion. NEW! NYS&W Timetable No. 26 (1955). NEW! Ian's Railroad Photos features a large and high-quality Susquehanna section. From England, a short photo essay on NYS&W #142. Visit this illustrated tour of the Paulinskill Valley Trail, which parallels former NYS&W trackage. Highly recommended site. Information on the Susquehanna's restored Driebe Freight Station in Stroudsburg, PA.
Railroad and Railfan magazine has an interesting article called Sparta Mountain and the Susquehanna Loop. A few excerpts from the newsgroups on the New York Susquehanna & Western Railroad maintained by Daniel Convissor. Jeff Sumberg maintains a great Susie-Q photo page. Background on NJ Transit's NYS&W Passenger Service Project. "The Standard Electric Locomotive of the World"
The PRR's famous GG-1 was one of the most beautiful and revered locomotives ever produced. Designed by Raymond Lowey, this engine changed the face of railroading forever. The GG-1 Homepage. Background, specs, and photo roster. Wes Barris presents the Surviving GG-1's Roster. HARRIS Mountaintop's Illustrated GG-1 Roster. Pierce Haviland's GG-1 Page. Pierce used to run 'em. The Virginia Museum of Transportation has a page on GG-1 Number 4919. SRS History, All-Time Roster, and Photo Gallery can be found at the Sperry Rail Service Page. Sperry Rail Service FAQ. Everything you've always wanted to ask about SRS but were afraid to ask! A photo of SRS #126 from the Maintenance of Way Gallery, and a close-up of the sensing truck. George Willard has posted a picture of SRS #139 at Suffolk, VA on his photos page. Car 120 of the Kingston Trolley Museum is former Sperry Rail Service #105. New York Perspectives: Photos by Phillip Buehler has several interesting rail-related photographs. Morningside Heights from the River (1908), in which a train of boxcars on the old New York Central tracks is visible. The Philadelphia Transportation Page has some great pictures of trains and trolleys from the Philadelphia Region, and also has a special page devoted to the Cape May Seashore Lines. Railpace Newsmagazine. 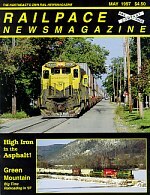 The May 1997 issue had a fascinating article entitled "High Iron in the Ashpalt," which detailed a line that runs through several miles of a city street in Erie, PA! I also personally recommend their book on NJ Transit Rail Operations, beautifully written and illustrated by Joel Rosenbaum and Tom Gallo. The New Electric Railway Journal - if you like trolleys! In addition to train-themed fonts, Benn's Trains & Tracks has a picture gallery and locomotive data. A page with some good photography links. Last material modification September 22, 1998. Copyright © 1998, Richard L. Ahrens.